When I told my family that I was going vegan, my brother told me that there was no way I would last because I loved cheese too much. Six years later, I am not looking back. This Cashew Cheese has become a staple in my diet as a dairy alternative. It’s a softer cheese and immensely versatile. There has been a rise of vegan friendly cheese options and I’m not talking about Daiya. I’m a label slob first and always look at the nutrition label looking for the fewest ingredients and ones that I can pronounce. Treeline, Miyoko’s, and Fauxmaggio are some of my favorite brands. The downside is that they don’t have that super melty ability of a traditional cheese. But I can certainly capture the creaminess and touch of flavor with my Cashew Cheese. This recipe is super adaptable for a soft cashew cheese. You can add more water for more of a sauce or keep it a bit thick for a soft cream cheese thickness. I’ve used it as a ricotta for pizza and lasagna, to make an alfredo and vodka sauce, and as a mayonnaise alternative for potato salad and Chickpea Tuna Salad. 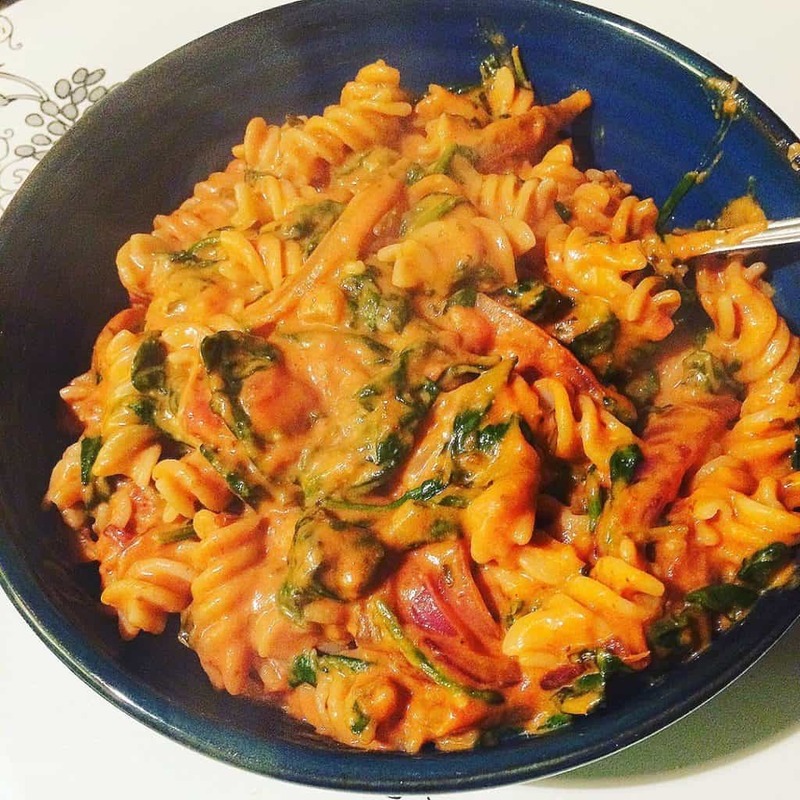 Add a ton of nutritional yeast for more of a Mac n Cheese flavor. Cashews are a great nut for cheese because they are soft. I usually am lazy and use right from the bag as my Vitamix will purée anything. Soaking them in advance is a great option if you don’t have a powerful blender. The lemon juice and mustard work to add some of the acid for a bite. I typically use lemon juice, but if I forget to buy any or want a mustard flavor it works great. The raw garlic and onion also contribute to a sharper taste and can be cut or reduced. 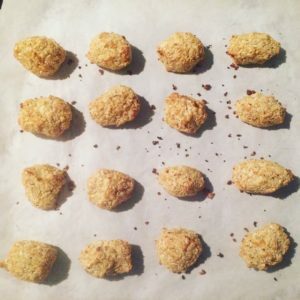 Nutritional Yeast (aka nooch) gives the cream a parmesan cheesy like flavor. No, it’s not an exact match, but it’s close. As a vegan, the fortified version helps supply me with B12, which I don’t get from anywhere else in my diet. Place all ingredients in a blender with about 3/4 cup of water. Purée. Add more water if needed. You may need to stop and mix the ingredients by hand. Taste and adjust ingredients. (You may need more lemon juice. Soak the cashews for 20-90 minutes in advance. Drain and rinse before using. This softens the nuts for easier blending. The cashew cream will keep for about 1 week in the fridge. Add dulse to increase the amount of iodine or for a seafood flavor. Use like a ricotta on pizza or lasagna, as an alfredo sauce, as a cheese sauce, as a mayonnaise, or however else you like. Kate Hamm combines her 15+ years of experience in the fitness industry and high-end resort program development into sought after wellness coaching and adventures at AnamBliss. Visit www.anambliss.com for more information on coaching services and future retreat dates and locations. I never liked the taste commercial sports drinks. And I'm a person who doesn't believe in drinking (or eating) something that I don't like. Finding a an alternative became a must for when I started training for my first half marathon. Fortunately, I realized that I could make my own homemade sports drink. I've used variations of this for many of my training and running races over 7 miles. I find that is when I need to have the sugar to carry me through a long run. The water helps with hydration. The sugar is for the glucose to help your muscles do their thing. The salt replaces the sodium lost with sweating to assist with the breakdown of the glucose. 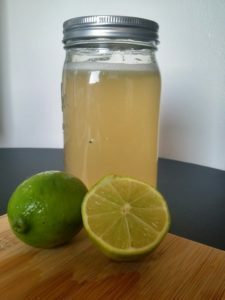 Place lime juice, honey, and salt in a quart sizes jar. (If you don’t have one, a Liter Water Bottle works as well.) Add water to fill. Cap and shake until all ingredients are combines. Drink and enjoy! Refrigerate any leftovers. Shake before drinking. Options: For different flavors, mix up your citrus juices. Try lemon, orange, or a combination. You can also use agave, coconut syrup, or maple syrup. If it’s too sweet for you, reduce the honey. Note: The serving size is the entire quart, but I find I drink only about a quarter at a time. How does this compare to Gatorade and Powerade? I love falafel. I think when Trader Joe's stopped having their Falafel wrap, was a very sad day for me. It was an easy go to meal for me, especially when I was traveling. Now I need to find other places for my falafel fix or make my own. I've found some options to be rubbery or very greasy, so I like this option of cauliflower falafel. As the weather warms ups, the cauliflower falafel is nice and light with a hint of warmth when the falafels are fresh. Falafel isn't immensely hard to make. 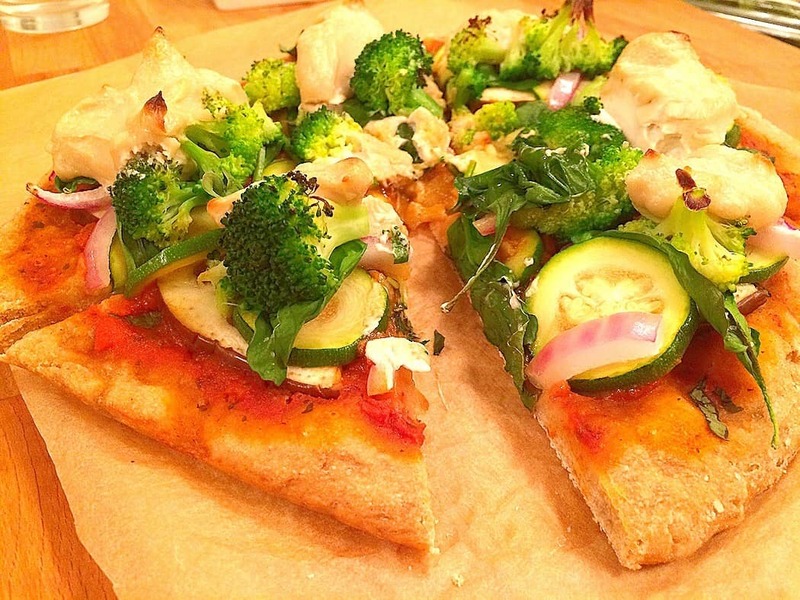 Using cauliflower as a main ingredient, you can add in more vegetables into your day. Kids may not even notice. Less fat is used by baking the falafels. Options for serving are endless. I enjoy the falafel as part of a salad with the spicy tahini dressing. 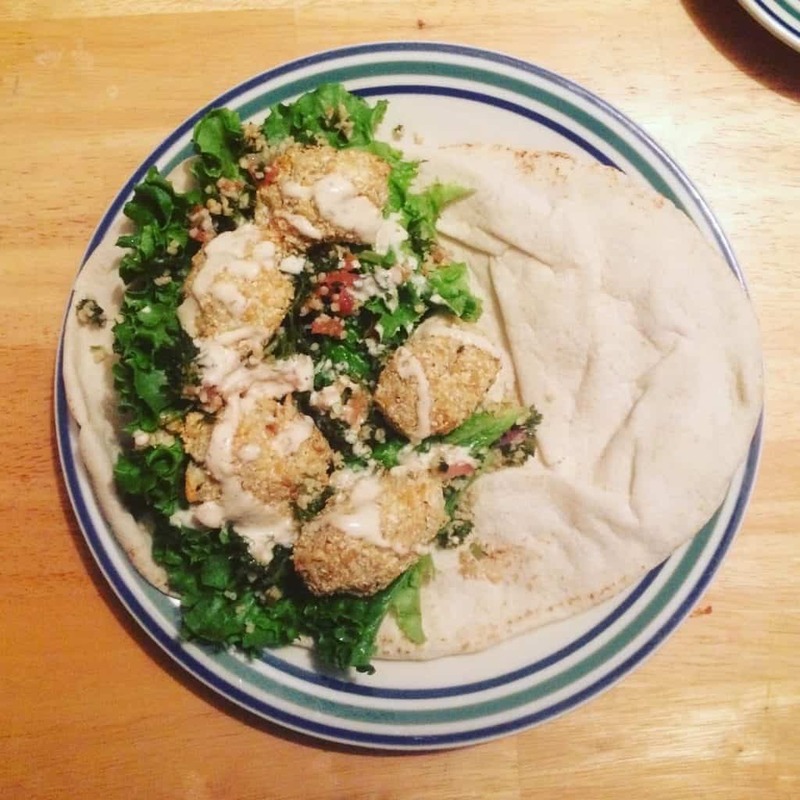 I recently rediscovered a local pita bread that is amazing, so have been enjoying my falafel as a wrap with hummus, lettuce, and a tahini sauce. Want a wheat free wrap option? Use savoy cabbage. Heat the oven to 400 degrees. Lightly spray some oil on a baking sheet or use parchment paper. If you have a food processor: Chop the cauliflower up into florets. Run the cauliflower florets through a food processor on pulse until the pieces of cauliflower kind of look like rice. Add the chickpeas, onion, garlic, oil, seasoning blend, and quinoa flakes to the food processor and pulse. Add salt if needed. If you do not have a food processor: Chop the cauliflower up into the smallest pieces possible or use a grater to create cauliflower rice. Mash the chickpeas in a medium bowl until they form a paste. Chop the garlic finely. Add the cauliflower, onion, garlic, oil, seasoning blend, and quinoa flakes to the chickpeas and mix. Add a pinch of salt if needed. The mixture should easily form into balls. If it is too dry, add a little water. Form the mixture into balls a little bigger than a ping pong ball. Place the balls on the baking sheet and bake them for 20-25 minutes, flipping them half way through. Both sides should be nice and golden. Add all items into a blender and blend. Add more water for a thinner consistency. Add salt and red pepper flakes to taste.